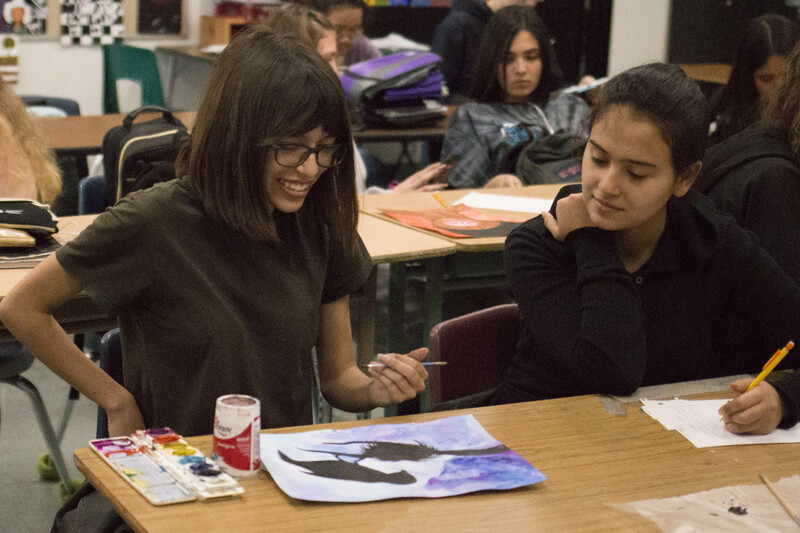 Students in this academy not only learn elements of art and principles of design, they put them to use through drawing, painting, mixed media, and sculpture. The Academy of Fine Arts at Santa Susana encompasses a comprehensive, rigorous series of hands-on, project based courses. The Academy of Fine Arts at Santa Susana encompasses a comprehensive, rigorous series of hands-on, project based courses designed to teach students the elements and principles of art and design as well as the drawing and painting skills necessary to become successful artists. Through the fine arts sequence of classes, students will put their creativity to work to find their artistic voice. We offer AP (college level) capstone classes in drawing and painting, design and sculpture. Students have the opportunity to build a professional fine art portfolio and receive college credit at the same time. This is a yearlong college level class for the serious art student that loves drawing and painting. Students will explore a variety of mediums, and build a portfolio that may be submitted to the College Board for college credit at the end of the year. Students are encouraged to explore and develop their own ideas, unleash their own creativity, and to make unique and provocative works of art that speak to their own unique artistic voice. This is a yearlong college level class for the serious art student that has a keen interest in design and using the elements and principles of a design to create unique, dynamic works of art. Students may use a variety of mediums including photography, collage, drawing, painting and printmaking. Students will explore a topic of their choice and do a series of artworks with a common theme that reflect their personal artistic voice. Student may submit a portfolio to the College Board at the end of the year for college credit. This is yearlong college level class for the serious art student that loves to create sculpture from a variety of materials. Students work with materials such a wire, clay, plaster, and found objects to create works of art that reflect their artistic voice. Students may submit a digital portfolio to the College Board at the end of year for college credit. This is a yearlong advanced art class that focuses on honing a students skill set and creative voice as a artist. Students will get the opportunity to work with both 2D materials such as watercolor, pastel, graphite, acrylic and also do some 3D sculptural projects using clay, found objects, wire and plaster. Students will have the opportunity to start building a portfolio for the College Board or for art school submission. This is a yearlong art class that focus on improving artistic skills such as drawing and shading, perspective and painting skills learned in Basic Design and using the elements and principles of design to produce creative solutions to hands on projects. All students that enjoy making art will find this class rewarding and fun. Basic Design is a course which covers drawing, painting, and sculpture, all through the lens of learning and using the elements and principles of art and design. This is a hands on class where students have the opportunity to imagine, create, and problem solve. This class is a prerequisite course for most academies. Must take any AP Art capstone class and complete a senior project.